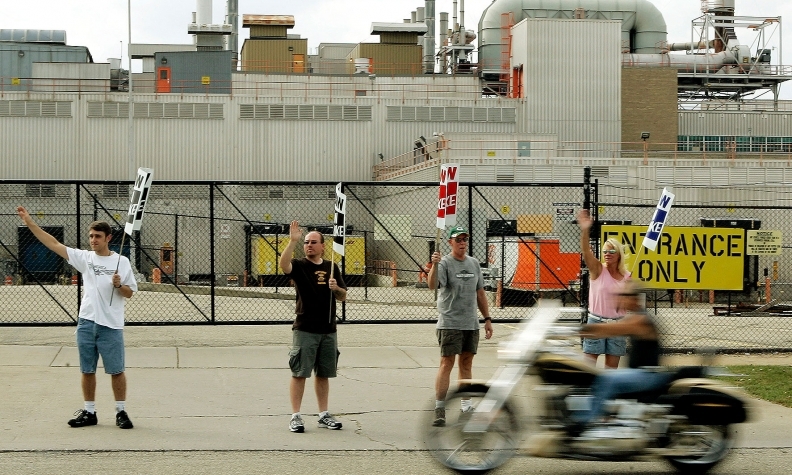 UAW members picket outside GM's venerable Janesville, Wis., plant in Sept. 2007. It was the first nationwide strike in 37 years at GM after the company failed to reach a new labor agreement with the union. DETROIT -- General Motors’ mothballed assembly plant in Janesville, Wis., is slated to be closed permanently, the UAW disclosed in documents related to its tentative labor deal with the automaker. Output at the 96-year-old plant was shuttered in December 2008, six months ahead of GM’s bankruptcy. The former SUV factory has been on so-called standby status since then. The 4.8-million-square-foot plant had peak employment in the 1970s of about 7,000 workers. Before its 2008 idling, it was home to production of GM’s large SUVs, the Chevy Suburban and Tahoe and the GMC Yukon and Yukon XL. By 2008, soaring fuel prices had crimped demand for big SUVs, forcing GM to trim production at Janesville and eventually close the plant. A Tahoe was the last vehicle to roll off of the assembly line, on Dec. 23, 2008. GM’s intention to permanently close the Janesville site was disclosed in a memo contained in documents the UAW posted on its website Wednesday, detailing its tentative four-year agreement with GM. The bad news for the town of 64,000 residents came one day ahead of Janesville native U.S. Rep. Paul Ryan, R-Wis., being elected as speaker of the House. The plant is in Ryan’s district. The memo, sent to UAW Vice President Cindy Estrada from GM labor chief Cathy Clegg, identified the Janesville plant as the only GM facility earmarked for closure or sale. The plant’s closing would come “during the term” of the four-year agreement if it’s ratified by UAW workers.